If you haven't tried stamps for your planner or bullet journal, you are in for a real treat! In this blog post, I'm going to discuss what these stamps are and how to use them with a step-by-step tutorial. 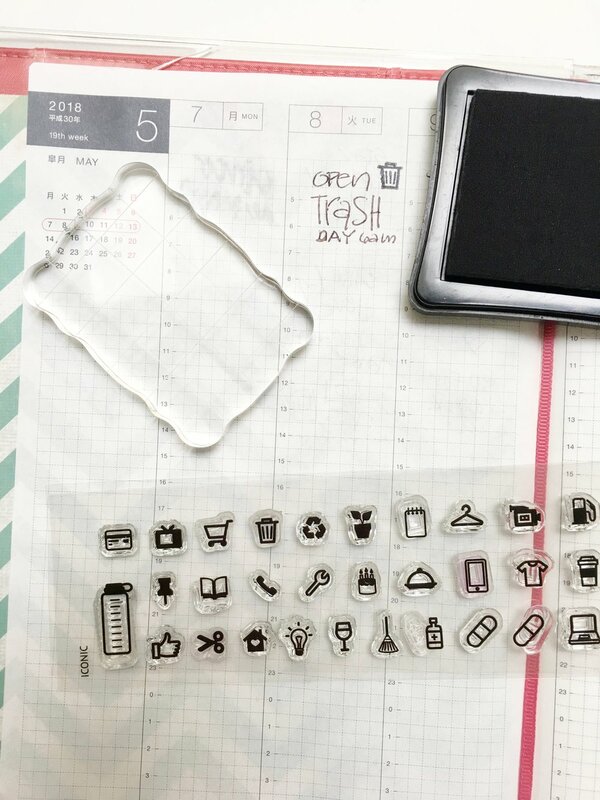 There are so many planner stamps available to choose from: days of the week, chores, daily task icons, frames, calendars, to-do lists, and more. Stamps are a fun way to decorate your planner or bullet journal as well as keep you organized and on task. I'll also give you lots of links to some amazing stamps you can use. Let's get started! Most likely, you've received stamps by elementary teachers to mark papers like, "Good Job!" Maybe you've seen stamps used for offices with "date" or "received." Stamps also gained popularity a few years back for scrapbooking. Those stamps came in all kinds of designs for memory keeping. Now, there's a new kid on the block for stamping. The new stamps are for planning and bullet journaling. These are the stamps I can't seem to get enough of! They are available in both rubber stamps and clear acrylic stamps. Rubber stamps are more traditional of the two stamps. 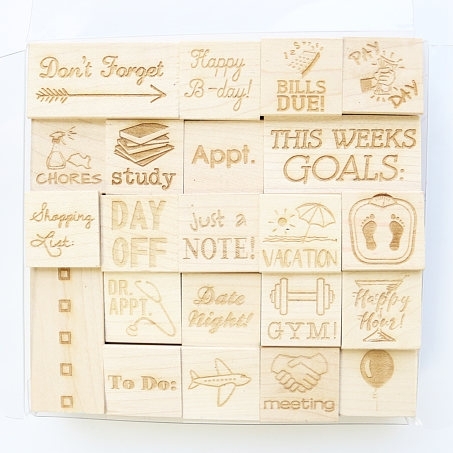 They are most often rubber based stamps mounted on wood blocks. I have a lot of these stamps! Clear stamps are acrylic stamps that are not mounted on anything. They are sandwiched between two pieces of clear plastic sheets to keep them clean and organized. Because the stamps aren't mounted on anything, you need to use a mounting block in order to use them. The blocks come in various sizes and you'll need to use a block that is larger than the stamp in order to have a clean, even stamping. Since most planner stamps are pretty small, you won't need many of these mounting blocks. I have two gridded mounting blocks so that I can line up the stamps before using them. You know I said I have a lot of rubber stamps, well guess what? I have EVEN MORE clear stamps! Because they arrive on sheets, you usually get an entire collection on ONE sheet. So, you get a lot more stamps for less money (than rubber stamps)! What I love most about clear stamps is that they are easy to store and take with me on the go. I use an old cosmetic bag to store my clear stamp sheets. There's also enough room to keep my smaller mounting block and a black stamp pad. To use rubber stamps, you'll stamp on the ink pad then on the planner. I keep a piece of scrap paper nearby to stamp out the excess ink before putting the stamp away. Clear acrylic stamps are a bit more involved, but just as satisfying to use. If you follow these simple steps, you'll keep the stamps clean and useable for years to come. Step 1: Select the stamp you want to use and peel it from the film. Place it on the mounting block. It will stick and stay in place until you peel it off. Step 2: Stamp it lightly on the ink pad a few times. Step 3: Stamp it on the desired planner/bujo page. Don't press to hard like I did or you'll end up with a smudgy stamp. Step 4: Use a piece of scrap paper and stamp out excess ink. Step 5: Clean both front and back of stamp with disposable wipes. Step 6: Place stamp back on plastic sheet. 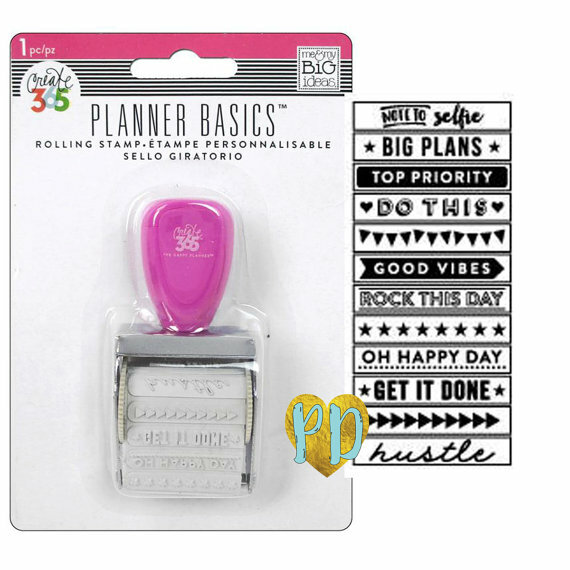 Are you ready to get stamping in your bullet journal or planner? Here's some rubber stamps and clear stamps to get you started! Clear stamps make planning easy! I love these: Kelly's Appointment Planner, Doing my Best Planner Stamps, Food & Travel Stamps. Plan your week, your tv watching, and your to-do lists with these fun stamps: Weekly Bullet Journal/Planner Stamps, TV & Movie Planner Stamps, and Planner Banner and To-Do List Stamps.